Welcome To The Home of csUnit! csUnit is your unit testing tool for the Microsoft .NET Framework. You can use it with all .NET languages including C#, Visual Basic .NET, J#, and managed C++ (more features). Extreme Programming (XP), one of the agile methodologies, relies heavily on fully automated tests and test-driven development. If you are developing for the .NET framework, then csUnit is your first choice! As a first step, you may want to see a brief overview of the features. Then we suggest to have a look at the tutorials. Or, download the latest version (2.0.1, MSI-file, 1.7 MBytes) or go to the download area for other downloadable items. You may also want to read the installation instructions first. Technical discussions and announcements for csUnit are available through our Yahoo!-Group csunit. This is the best place to ask questions, get answers, offer advice, or suggest changes to the tool. February 18, 2006: csUnit 2.0.1 Released, see Downloads. February 14, 2006: Many people are using 2.0.0 Beta. Still we thought that it's time to release the version by finalizing csUnit 2.0.1. A few issues are still open, but we plan to have it finished by the end of this month. After that we plan to work on a version for VS.NET 2005. 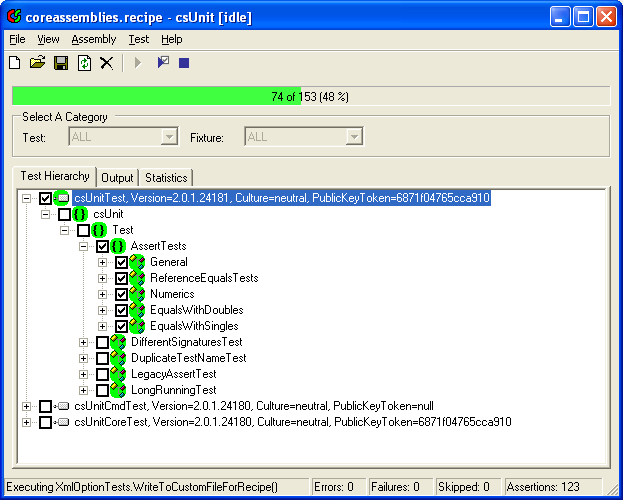 A first version for that is planned for end of March 2006. May 17, 2005: csUnit 2.0.0 Beta available. Copyright © 2002-2006 by Manfred Lange, All rights reserved. Last change: 2/14/2006. Site design by Andreas Weiss. This site is protected by bot traps.